The social (and economic!) value of paid family leave benefits is undeniable. Research indicates more bonding time lowers rates of infant mortality, improves infant health, and has a strong positive correlation to improved access to medical services. And when workers have time to recover from a serious illness or care for an ailing parent, they have higher morale and are more productive when they return to work. But despite these obvious benefits, the United States has been reluctant to guarantee workers the right to earn parental leave on the job. As the only industrialized nation without a paid maternity leave system, some U.S. states have taken it upon themselves to implement state-level paid family leave insurance programs — allowing workers to earn paid maternity leave. But these benefits are only available in 5 states, and are linked to the ‘disabled status’ of the pregnant women — meaning fathers and adoptive parents are not eligible to earn the benefit. So what are mothers in the other 45 U.S. states (and American fathers) missing out on? Here’s a quick look at paid leave programs in Sweden, Canada and Australia, compared to that of the U.S. — and Washington State in particular. Sweden is the likely world leader in providing paid family leave benefits. The Swedish state-sponsored system of family leave is designed specifically to ensure parents — both mother and father — form strong bonds with new children. They provide 13 months of generously paid leave to new parents — with two months designated exclusively for fathers (the total benefit is 480 days). But that’s not all. After 12 months, Swedish children have access to highly subsidized quality preschool education. And should elderly parents get sick? The state-sponsored elderly care system ensures they will receive care around the clock care — so adult children don’t have to patch together leave time in order to care for them. 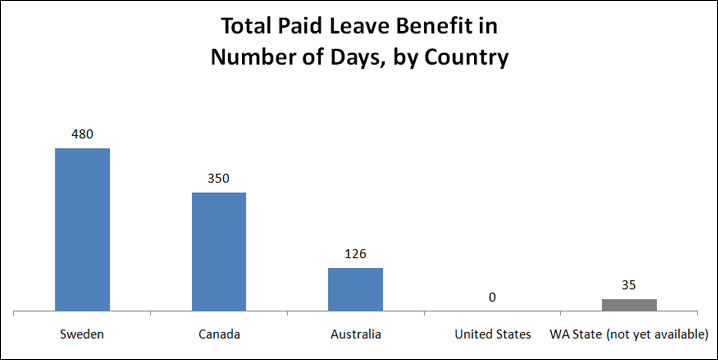 Our neighbors to the north in Canada also have quite a robust paid family leave program . For new mothers, maternity benefits are offered for 15 weeks, plus 35 weeks of paternity benefits that can be split between the two parents (a total benefit of 50 weeks). The typical benefit rate is 55% of the parents’ wages, but low-income parents are eligible for more. Sickness and ‘compassionate care’ benefits are also available for for seriously ill workers or to care for a gravely ill family member, and are available for 15 and 21 weeks, respectively. Even Australia, who until earlier this month accompanied the U.S. in the ranks of the only industrialized nation to not guarantee paid maternity leave, just passed a paid family leave law. The Australian law guarantees 18 weeks of maternity leave for new mothers at the federal minimum wage of $14.31 AUD per hour (about $12.60 USD) — more than $500 AUD per week. Stay-at-home mothers will continue to receive a ‘baby bonus’ of $5,000 upon the birth or adoption of a new baby, and Australia also guarantees workers get 8-10 fully paid days of leave for personal sickness, bereavement, or to care for an ill family member. Now compare that to the U.S. Federal law that guarantees just 12 weeks of unpaid leave — and only a handful of states offer paid leave for mothers. The typical benefit is six weeks of job-protected leave with partial wage replacement for mothers; no benefits are offered to new fathers. Washington State passed a paid family leave insurance law in 2007, but no funding source was designated by the legislature — so implementation has been pushed back to October 2012. Once up and running, the program will offer new mothers 5 weeks of time off, with partial wage replacement of $250 per week. Current state law doesn’t guarantee workers the right to earn paid leave — even though just 41% of Washington workers earn paid sick leave on the job — but it does guarantee workers who receive sick leave or other paid time off are able to use it to care for an ill spouse, child under 18, disabled child over age 18, parent, parent-in-law, or grandparent. Federal start-up funding to help Washington’s paid leave program get off the ground is in the works, and would be a big win for families. Ensuring U.S. families are strong and healthy is an issue that spans the political spectrum. You can use this handy Candidate Questionnaire from the Washington Family Leave Coalition in the upcoming election season to ask your elected officials how they plan to work for working families in the months ahead.